What’s fantastic about this game is that there are so many playing it. When I discovered over thirty-two thousand players had submitted a solution to the first problem, I knew the game dynamic had to be good in order to attract so many players. 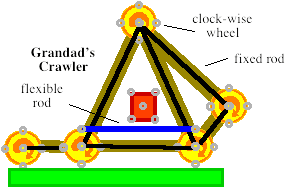 You build your Fantastic Contraption from an assortment of wheels and rods (see below). 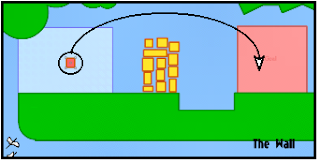 When set in motion, your contraption will move according to basic, physical principles. It will topple or fall if overbalanced. If it’s too heavy for the drive wheels, it will stall trying to climb a gentle slope. At the higher levels, it’s doubtful your contraption will solve the problem the first time it’s set in motion. A failed design means you have to think through why it didn’t work, and then design and apply a fix. Test again, and perhaps fix again, until the problem is solved. Each of the first 20 (free) problems requires you to build a contraption that will carry a small red circle or square (I call it the football) from a light-blue box on the left side of the field of play into a light-red box on the right side of the play field (see below). The contraption can carry, push, drag, sling, or shoot the “football” into the light-red box, in any manner you choose. 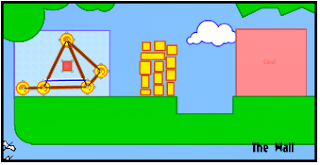 In problem five, called The Wall (see picture above), you build a contraption in the light-blue box, that carries the red square through the wall of yellow blocks, across the gap, and into the light-red box. This is the contraption I built for solving The Wall. I used five clock-wise wheels, six brown fixed rods, and one blue flexible rod. The following picture shows my contraption poised and ready to go. I saved my solution to The Wall and published it online for others to see and use. Over 62,000 solutions to this problem have been published! The solutions I looked at are much more clever than mine. To see my contraption in action, view the following video. Go to http://www.fantasticcontraption.com and open a free account (Username–Password). Having an account let’s you save your progress, upload your solutions for others to examine, and to look at the methods of other players used to solve the problem. Fantastic Contraption is also available on the IPhone and Ipod Touch. Grandad is currently trying to solve Problem 13, Big Ball. Help!